Farming ain’t easy. Animals insist on eating EVERY day. It never rains enough and when it does, it rains too much. This season? Forget about your tomatoes: your entire crop melted thanks to some random blight. It’s no wonder industrial agriculture sprays gallons of pesticides on their crops; if you insist on farming organically everything is truly against you. Plus sissy customers whine when they find a slug in their salad mix. About ten years ago, for some reason, my parents retired early from their prestigious careers to start an organic farm. They’ve done a remarkable job, and despite what they might say, they’ve successfully built something great from nothing. I try to get out there whenever the intensity of city life outweighs my need for high speed internet. 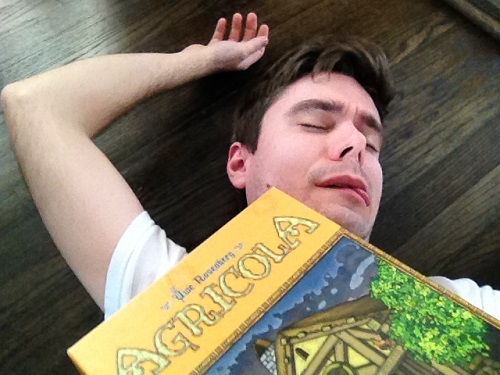 On one visit ages ago some friends came out with us for a long weekend and they brought the board game Agricola. A board game about farming while we’re at the farm? It was thematically perfect. It had a billion pieces and looked absolutely terrifying, but the little wooden animal pieces put us at ease. Sure, the rulebook had a scary amount of pages but looooooook at those little wooden sheep! In Agricola you play as farming families in 1670’s Central Europe (that familiar time and place) trying to keep yourselves alive. You collect resources like wood and stone, raise crops and animals, and expand your home, pastures, and fields. Each turn players place a “family member” token on sections of a shared central board which will result in that player being able to take some sort of action or receive some resources. One section for instance would allow that player to spend wood to build additional fences used to pen in animals. The tricky part is that once someone places their family member in a section no other players may do so for that round. If everyone wants to bake bread, only the first person to place their piece on that space gets to, often resulting in some anguished yelling from everyone else. The challenge of Agricola, besides trying to plan around the actions of other players, is harvest rounds when everyone must feed their family—two food tokens for each member. Early on before you’ve established any sort of infrastructure this can be perilous as you haven’t yet sown and harvested fields or set up buildings that allow you to process meat in any meaningful way. Failure to feed family members results in negative points being assessed against you at the end of the game. Scoring at the end of the game is based on a number of factors, but broadly, it’s how much you’ve accomplished subtracted by how much you didn’t. You could have raised a good number of sheep and pigs, earning a lot of points, but not having any cows and not having any vegetables in your stores will count against you just as much. Also, there’s a cap on how many points things will earn you. The very first time I played Agricola I misunderstood the scoring system and decided that I would win by becoming KING OF THE SHEEP. I ultimately had about 16 sheep, not realizing that any sheep above 8 didn’t actually earn any points. I lost the game quite badly as I hadn’t invested in anything else. Forcing balance in Agricola, while less exciting, is necessary. If you aren’t forced to play that way it would be too easy to see what the other players aren’t going for and focus on that industry entirely. Surely that would lead to KING OF THE SHEEP and KING OF THE VEGETABLES in a boring showdown at the end of the game. Plus, in a way, it makes Agricola a lot closer to an important lesson of real farming—ensuring that you’re raising/growing a diverse range of products. Calamity is always right around the corner and relying on a single crop or animal is risky business. We don’t get Agricola to the table often enough. The box is HEAVY. The threat of being crushed to death when pulling it off the shelf alone makes it hard to get a session going. It’s just all those pieces. The game is better played with three to four people and it’s less physically risky. My wife and I are ever on the hunt for good two-player board games and one day after a trip to our local game store she brought home Agricola: All Creatures Great and Small (hereafter referred to by the ridiculous acronym, AACGS). It only took a few flips through AACGS’s rulebook to realize that I was in love (my wife is pretty awesome too). 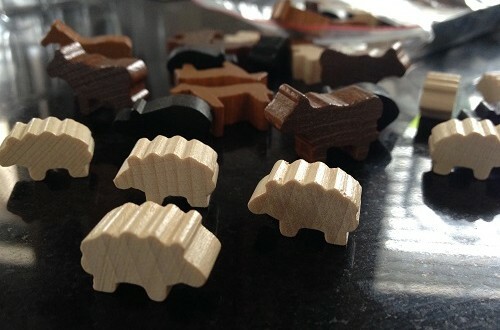 The game comes with many, many little wooden animals that I wanted to place in a pile and roll in. AACGS gets it. It understands what we really want from Agricola—no more silly feeding your family, no more weird and mostly useless Occupation and Improvement cards, and no more distractions from what’s truly important, squeezing as many of those little animals onto a game board as possible. The object of AACGS is simply to raise as many of the four types of animals as possible. There’s still a scoring cap but the game never lasts long enough that I’ve found it to be an issue. Predominantly the strategy of the game is to figure out the best way to house all your animals since any animals owned beyond what your infrastructure can handle will “run away”—fenced pastures and stables can only hold a certain number of animals. 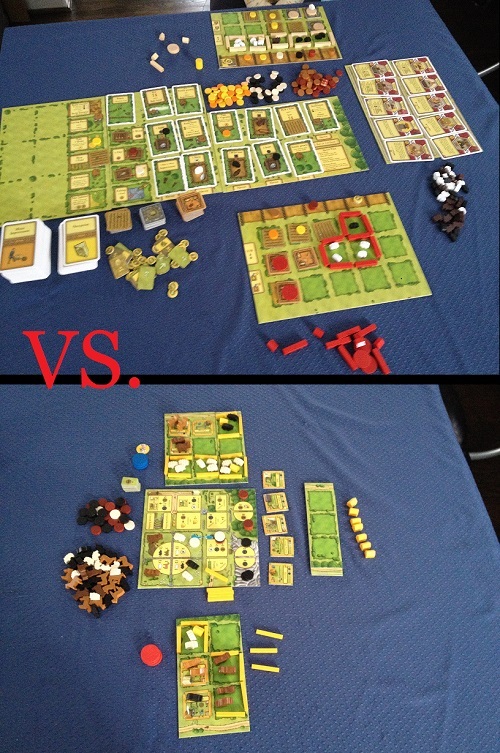 Compared to regular Agricola, AACGS is over in an instant, with games lasting 40-minutes-long at most. AACGS has become one of our top “making dinner” games. Something we break out when we want a game with a little more meat but something that plays quickly enough to get through while we wait for dinner to finish, or at least long enough to finish a glass of wine. I’d love to play Agricola more often but it’s simply not practical to do so, especially when my gaming circle tends to want to spend its limited free time playing newer games. The next time my Dad needs me to come down to the farm to help butcher chickens (gross) I’ll be sure to bring Agricola with me as it’s still fun to play with a bunch of people. AACGS, however, while only two-player, has filled that Agricola niche for everyday gaming and manages to be just a little more fun to play. P.S. 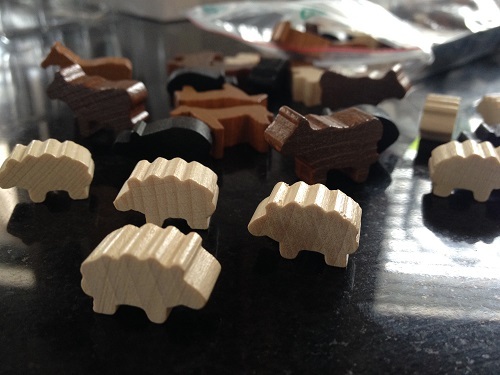 The little animal pieces didn’t actually come with the regular game of Agricola. In the base game they were represented by little cubes (lame) and the animals were an expansion sold by another company. I swear newer printings of Agricola now come with the animal pieces but I wasn’t able to verify that. AACGS does come with actual animal pieces and is that much cooler for it. OK I’m convinced – really need to try AACGS! Because my criticisms of Agricola mirror yours. Also reminds me I need to teach you Rosenberg’s easier farming game – At the Gates of Loyang.